Net sales of $778 million in the second quarter of 2015 compared to $321 million in the second quarter of 2014. Operating income before special items of $14 million in the second quarter of 2015 compared to $12 million in the second quarter of 2014. Verso's net sales for the second quarter of 2015 increased $457 million, or 142%, due primarily to the addition of net sales resulting from the NewPage acquisition, compared to the second quarter of 2014. During the second quarter of 2015, Verso recorded special items affecting operating income totaling $9 million, or $0.11 per diluted share, primarily related to integrating the legacy Verso and NewPage operations, restructuring costs associated with the NewPage acquisition and closure of the Bucksport mill. During the second quarter of 2014, special items of $9 million, or $0.16per diluted share, were primarily attributable to costs related to the NewPage acquisition. 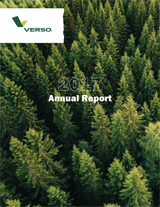 "Verso's results for the second quarter showed our resilience in the face of industry headwinds," said Verso President and Chief Executive Officer David Paterson. "The results reflected strong performance improvements which include increased gross margin, a 16% reduction in SG&A compared to the first quarter of 2015, and double-digit adjusted EBITDA growth. As our integration efforts continue, our synergy achievement is ahead of expectations, with savings to date of $41 million. "Looking ahead, we continue to focus on keeping our people safe, integrating the NewPage business, achieving additional synergies across the entire company, and exceeding our customers' expectations." Net Sales. Net sales for the second quarter of 2015 increased 142% to $778 million from $321 million in the second quarter of 2014. Our sales increase was primarily driven by a 122% increase in total sales volume, from 407 thousand tons in 2014 to 902 thousand tons in 2015. The increase in volume resulted in $408 million of additional revenue, while the change in pricing contributed $48 million, as the average sales price per ton increased from $789 to $862, for all of our products in the second quarter of 2015 compared to the second quarter of 2014. Net sales for our paper segment increased 163% to $723 million in second quarter of 2015 from $275 million in the second quarter of 2014, due to a 144% increase in paper sales volume to 802 thousand tons in the second quarter of 2015 compared to 329 thousand tons in the second quarter of 2014, supplemented by an 8% increase in average sales price per ton of paper to$900 in the second quarter of 2015, compared to $835 in the second quarter of 2014. The increased sales volume, which is primarily due to the addition of sales resulting from the NewPage acquisition, resulted in $395 million of additional revenue which was augmented by the impact for the change in price of $52 million. The increase in pricing was due to the addition of a different mix of paper products from NewPage. Net sales for our pulp segment increased 20% in the second quarter of 2015 to $55 million from $46 million in the second quarter of 2015, due to a 30% increase in pulp sales volume to 100 thousand tons in the second quarter of 2015, compared to 77 thousand tons in the second quarter of 2014, while the average sales price per ton declined 6% to $557 in the second quarter of 2015 compared to $593 in the second quarter of 2014. The increased sales volume, which is primarily attributable to the addition of net sales as a result of the NewPage acquisition, contributed $13 million of additional revenue, while the change in pricing resulted in a decrease in revenue of $4 million. The price decline was attributable to market price reductions. Cost of sales. Cost of products sold, excluding depreciation, amortization, and depletion expenses, increased $381 million, or 138%, while depreciation, amortization, and depletion expenses increased $39 million, or 156%, primarily due to incremental costs as a result of the NewPage acquisition. Our gross margin percentage was 15.5% for the second quarter of 2015 compared to 14.1% for the second quarter of 2014, reflecting an incremental $76 million in gross margin, with $55 million attributable to volume increases and $21 million attributable to higher margin per ton as a result of a different mix of paper products from NewPage. Selling, general, and administrative. Selling, general, and administrative expenses increased primarily due to incremental expenses of $29 million, or 171%, in the second quarter of 2015, compared to the second quarter of 2014, as a result of the NewPage acquisition. Selling, general, and administrative expenses are allocated to the paper and pulp segments based on relative sales volume. Restructuring charges. Restructuring charges of $6 million during the second quarter of 2015, consisted of approximately $3 million of severance and benefit costs related to efforts to integrate the legacy Verso and NewPage operations and $3 million of expenses related to the sale of the Bucksport mill. Restructuring charges for the second quarter of 2015 related primarily to the paper segment. Interest expense. Interest expense for the second quarter of 2015 was $67 million compared to $36 million for the second quarter of 2014, reflecting the addition of the NewPage ABL Facility and NewPage Term Loan Facility, the New First Lien Notes issued in connection with the acquisition and changes resulting from the completion of the second lien and subordinated notes exchange offers. Net Sales. Net sales for the six months ended June 30, 2015 increased 156% to $1,584 million from $620 million in the six months ended June 30, 2014. Our sales increase was primarily driven by a 135% increase in total sales volume, from 778 thousand tons in 2014 to 1,831 thousand tons in 2015. The increase in volume resulted in $868 million of additional revenue. The revenue increase associated with the increased volume was enhanced by the impact of pricing improvements of $96 million, as the average sales price per ton increased from $796 to $865, for all of our products in the six months ended June 30, 2015, compared to the six months ended June 30, 2014. Net sales for our paper segment increased 173% to $1,471 million in the six months ended June 30, 2015 from $538 million in the six months ended June 30, 2014, due to a 154% increase in paper sales volume to 1,627 thousand tons in the second quarter of 2015 compared to 640 thousand tons in the second quarter of 2014, supplemented by an 8% increase in average sales price per ton of paper to $904 in the six months ended June 30, 2015, compared to $840 in the six months ended June 30, 2014. The increased sales volume, which is primarily due to the addition of sales resulting from NewPage acquisition, resulted in $829 millionof additional revenue which was augmented by the impact for the change in price of $104 million. The increase in pricing was due to the addition of a different mix of paper products from NewPage. Net sales for our pulp segment increased 38% in the six months ended June 30, 2015 to $113 million from $82 million in the six months ended June 30, 2014, due primarily to a 48% increase in pulp sales volume to 204 thousand tons in the six months endedJune 30, 2015, compared to 138 thousand tons in the six months ended June 30, 2014. Concurrently, the average sales price per ton declined 7% to $554 in the six months ended June 30, 2015 compared to $594 in the six months ended June 30, 2014. The increased sales volume, which is primarily attributable to the addition of net sales as a result of the NewPage acquisition, contributed $39 million of additional revenue, while pricing resulted in a decrease in revenue of $8 million. The price decline was attributable to market price reductions. Cost of sales. Cost of products sold, excluding depreciation, amortization, and depletion expenses, increased $807 million, or 140%, in the six months ended June 30, 2015 compared to the six months ended June 30, 2014, while depreciation, amortization, and depletion expenses increased $70 million, or 137%, primarily due to incremental costs as a result of the NewPage acquisition. Our gross margin was 12.6% for the six months ended June 30, 2015 compared to 6.8% for the six months ended June 30, 2014, reflecting an incremental $157 million in gross margin, with $57 million attributable to volume increases and $100 millionattributable to higher margin per ton as a result of a different mix of paper products from NewPage. Selling, general, and administrative. Selling, general, and administrative expenses increased primarily due to incremental expenses of $66 million, or 189%, as a result of the NewPage acquisition. Selling, general, and administrative expenses are allocated to the paper and pulp segments based on relative sales volume. Restructuring charges. Restructuring charges for the six months ended June 30, 2015 were $28 million, and consisted of approximately $16 million of severance and benefit costs related to efforts to integrate the legacy Verso and NewPage operations and $12 million of expenses related to the sale of the Bucksport mill. Restructuring charges for the six months ended June 30, 2015 related primarily to the paper segment. Interest expense. Interest expense for the six months ended June 30, 2015 was $133 million compared to $70 million for the same period in 2014, reflecting the addition of the NewPage ABL Facility and NewPage Term Loan Facility, the New First Lien Notes issued in connection with the acquisition and changes resulting from the completion of the second lien and subordinated notes exchange offers. Verso Corporation is a leading North American producer of printing and specialty papers and pulp. Our papers are used primarily in commercial printing, media and marketing applications, including magazines, catalogs, books, direct mail, corporate collateral, retail inserts, label and converting, flexible packaging and technical paper applications. Our market kraft pulp is used to manufacture printing, writing, and specialty paper grades and tissue products. Headquartered in Memphis, Tennessee, with a business center in Miamisburg, Ohio, Verso operates eight mills strategically located in Kentucky, Maine, Maryland, Michigan,Minnesota and Wisconsin with a total annual paper production capacity of approximately 3.6 million tons. Additional information about Verso is available at www.versoco.com. Verso will host a conference call on Tuesday, August 11, 2015, at 9 a.m. (EDT) to discuss second quarter results. Analysts and investors may access the live conference call by dialing 785-424-1666 or, within the U.S. and Canada only, 877-876-9177, access code 3516002. To register, please dial in 10 minutes before the conference call begins. The conference call and presentation materials can be accessed through Verso's website at investor.versoco.com by navigating to the Events page, or athttp://investor.versoco.com/eventdetail.cfm?EventID=162881. This release and Verso's quarterly report on Form 10-Q for the three months ended June 30, 2015, will be made available on Verso's website at investor.versoco.com by navigating to the Financial Information page. A telephonic replay of the conference call can be accessed at 719-457-0820 or, within the U.S. and Canada only, 888-203-1112, access code 3516002. This replay will be available starting at 12 p.m. (EDT) on Tuesday, August 11, 2015 and will remain available for 14 days.